Next up is the Songo Forces (or the Sun Wu faction), descendants of the great Sun Tzu! Having inherited rulership of Go upon the sudden passing of her elder sister, “The Little Conqueror” Sonsaku, she is a young ruler who would rely on her advisor, Shuuyu, were they not at opposing views. Since her position places her in the shadow of her sister, who was highly-praised as a grand ruler, she feels the need to always strive to be a great general and a great ruler lest ill comparisons be made. As a a leader, she is one of the more conservative leaders of the three. Her traditional strategies focus on reducing casualties in her own forces and thus tend to be quite defensive, a stark contrast to Sousou’s aggressive nature. Mostly content with ruling her own country, she would rather wait and strike when the time was right than take the initiative and make aggressive advances, despite her advisor’s encouragement for the need to wage war. She initially considers allying herself with Kazuto’s forces in order to eliminate Sousou, which she sees as the greater and more prominent threat to her lands. She hopes to maintain a stable peace with Kazuto after Sousou is defeated, but is that possible? Or is something behind the scenes seeking to ruin her plans? "My life is all for Sonken-sama!" 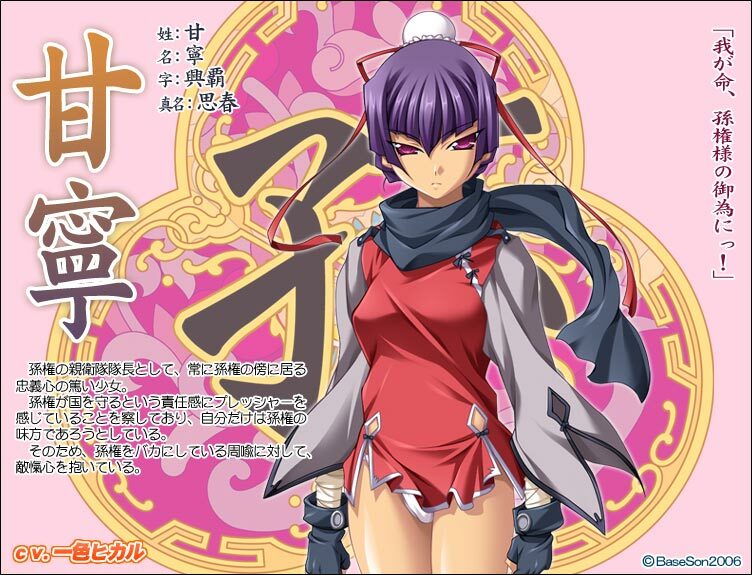 Kannei is the commander of Sonken’s personal guard, a highly devoted and loyal general who always serves by her side. Noticing that Sonken is suffering under the pressure and responsibilities of ruling a nation, Kannei swears that she will be the one to support and protect Sonken. It is due to this personal oath that she often finds herself in opposition with Shuuyu, who often thinks lightly of Sonken. "...Aha, doesn't it sound nice and interesting!" She is a very calm person, highly trusted by Shuyuu, Sonken, and Kannei as well. She’s a relaxed girl who’s always smiling, but she also has the talent to have read and memorized countless books from all over the world. She loves Sonken for her sweet side and always watches over her, but finds herself trapped in the middle between Sonken and Shuuyu’s antagonism. "...I do have a plan. Allow me to skillfully capture Kan'u for you." 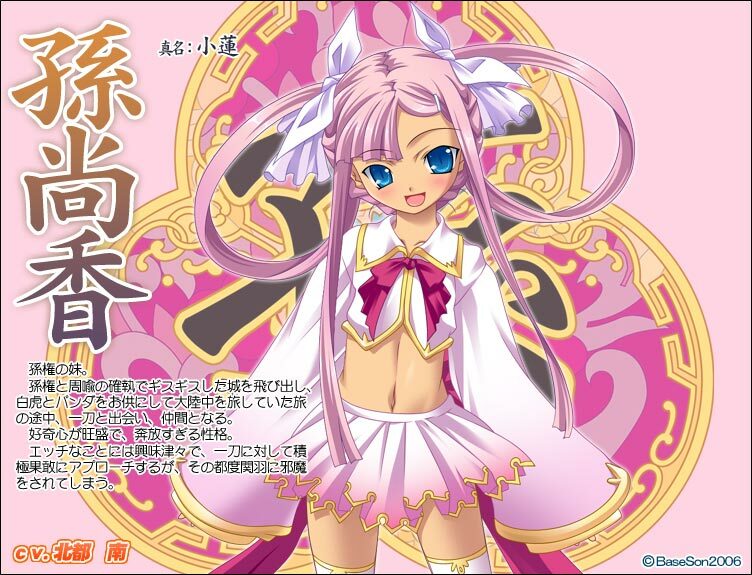 Shuuyu is the best friend of Go’s previous ruler, Sonsaku, and after Sonsaku’s passing she continues on Sonsaku’s love for her country and tries to support her beloved friend’s sister Sonken. Her strategies are cold and calculating, and often heartless and deceptive as well. She loves her friend Sonsaku, and remains devoted even after her passing. It is this reason that leaves her frustrated at Sonken’s naivety and lack of ability. 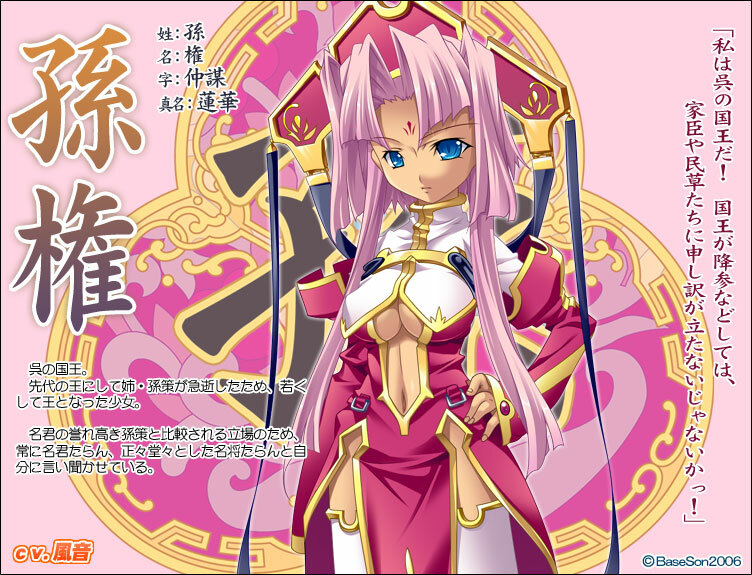 Last but not least are the two twins heralded as the most beautiful women in all of China: Daikyou and Shoukyou. Being twins, both girls are voiced by Daishou Tsuzura, a voice actress with 100 different titles including Fate/Stay Night‘s Makidera Kaede, Akaneiro ni Somaru Saka‘s Tachibana Mikoto, Nanatsuiro Drops‘s Akihime Sumomo, and several roles in Dies Irae ~ Acta est Fabula~. Daikyou is the elder of the two twins, and while she was Sonsaku’s wife and lover, after Sonsaku’s passing she followed her will and began to serve Shuuyu. By day she acts as Shuuyu’s pet and maid, carrying for Shuuyu’s every needs, and by night she serves as Shuuyu’s “companion”. Of the two twins, Daikyou is the one with a little something extra under the hood. Shoukyou is the younger of the two twins, and wife to Shuuyu. Just like her sister, Shoukyou serves as Shuuyu’s pet and maid. Shoukyou is also deeply in love with her sister Daikyou, though that love is slightly twisted and she enjoys teasing her older sister. She is a normal girl under the hood. Yeah, Kannei's one of the few characters who actually wears historically accurate underwear-a loincloth. This entry was posted on Monday, February 7th, 2011 at 2:30 pm and is filed under Character Introductions. You can follow any responses to this entry through the RSS 2.0 feed. Both comments and pings are currently closed. Kazane, huh? I did like Hayami, though few of her roles click otherwise. I thought Sonshoukou sounded familiar. Fumio is quite a contrast to her though. I know the twins were voiced by Michiru Yuimoto, though I wasn’t aware of any other aliases besides Fuuri Samoto. Either way, ❤ Sumomo, though there appears to be a lack of mention of her famous role as Jun Watarase. Also, I'm obligated to mention her role as Asuho Minahoshi in Hoshizora no Memoria. Her dere lines are great. ❤ Did not know that she was Mikoto's voice though, that's cool. 1. The first voice file for Sonken is wrong. 2. Sonshoukou doesn’t have a quote. Other than that, a very interesting read again. 1. No? You hear her say “Son Chuubou” but that’s her Last Name + Common Name. It’s still Sonken. It’s similar to Kan’u announcing herself as Kan Unchou. 2. That’s because if you notice, on her image, she didn’t have a quote to be translated like the others did. 3. Fixed. Apparently BaseSon typo’d the original final name. February 28th is the last day I’m able to apply for Universities for this Fall. 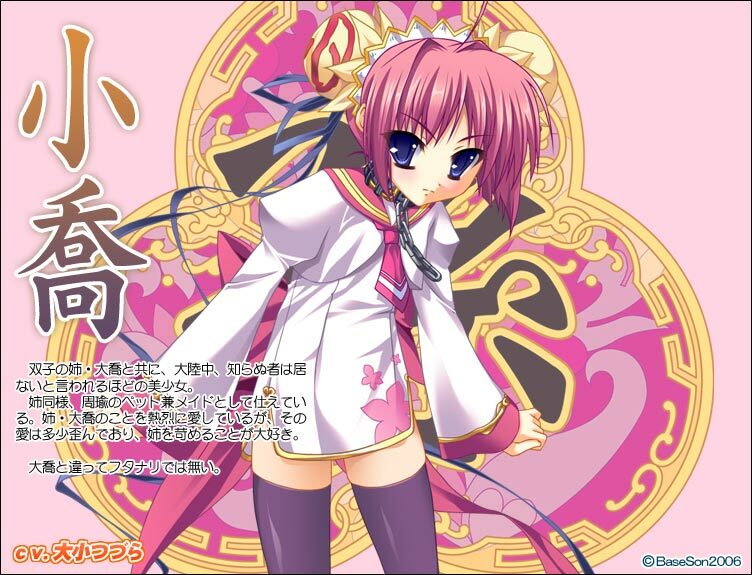 I’m sure I’ll forget all about it and end up playing Koihime Musou. Off Topic: Anyone else noticed the small smiley-face at the bottom of the blog? Or am I slow for realising this just now? <_<;; I never even noticed it before. Holy crap, the PNG CGs really ARE back! I was thinking maybe the last post was just a fluke since it wasn’t a post made by kouryuu9, but here it is. I know it’s a trivial thing, but seeing how I have my browser set to 120% zoom by default, it’s kind of important (since, ya know, JPGs don’t scale all that well). Remember, JPG images get JPG thumbnails, which reduces the quality even more; however PNG images get PNG thumbnails. 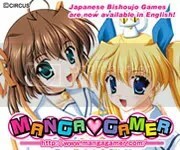 Was kinda on the fence about this VN but i’ll most likely get it. Mainly because of the art and possable voices later. It will be released when Koihime reaches 2000 sales. You know this, so stop complaining about the voice patch. Well, that’s true. But Yagami’s post (which was deleted) complained to MangaGamer that there was still no official voice patch. That’s the thing I was commenting on. Of course there will be a fan voice patch for Koihime. In fact, I think they’re already done; just waiting for the release. What..Does she just revive from the dead on something x3? A harem is fine too! What were the roles that Kawashima Rino had in Inganock?, because I know that she’s Kia (did come as a surprise though, since Kia is so loli) as opposed to her roles in Kira Kira, G-Sen, and Canvas. Man I liked. Shuuyu, Sonshoukouand Shoukyou. 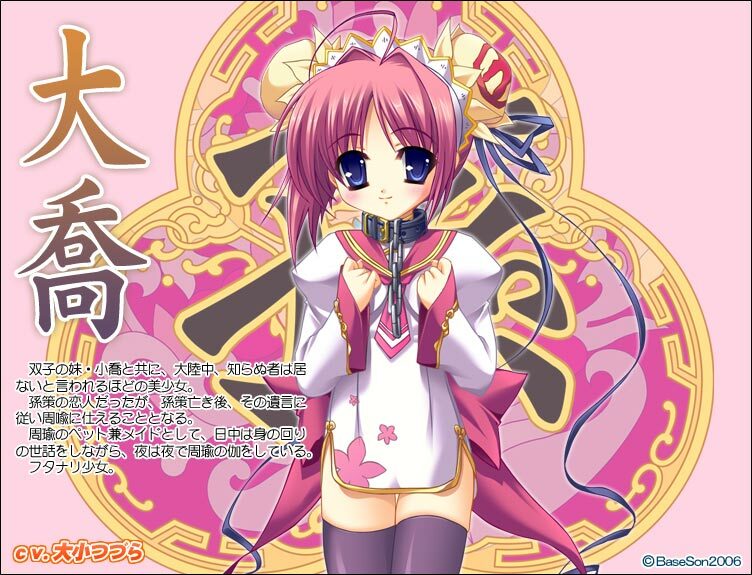 I want to play koihime soon.